When Beth and Zoe set out to help cats in need through the charity, International Cat Care, they were amazed at the response. Incredible true stories poured in from cat lovers around the world. As varied as cats themselves, each story is guaranteed to delight, and each book purchased will help support the work of International Cat Care. 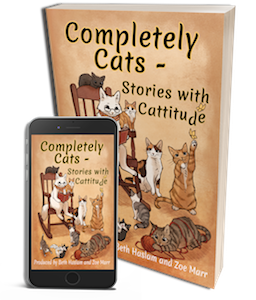 “In ‘Completely Cats’, Beth Haslam and Zoe Marr have put together a fantastic collection of amusing, uplifting and inspiring stories about our feline friends. For all those who love cats it is a must read that will grip you from beginning to end. And it’s wonderful that so many cats in danger or distress throughout the world will be helped by every copy sold.” Lord Black of Brentwood, Patron, International Cat Care. “Meet wild cats, posh cats, thief cats, vampire cats, heroic cats, orphan kittens, and even some cats so talented they can tell their own stories. This delicious bundle of pussycat tales will enchant any self-confessed feline fanatic like myself.” Victoria Twead, New York Times bestselling author of Chickens, Mules and Two Old Fools.